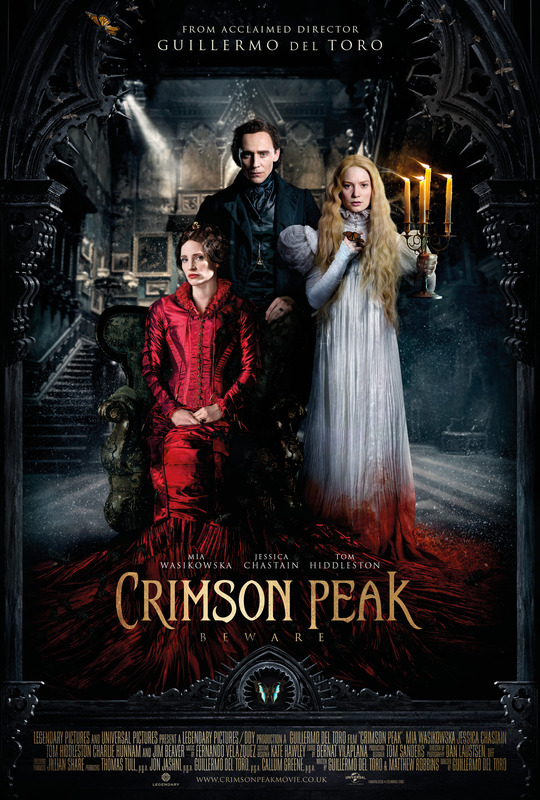 Contrary to those ads you’ve been seeing and the trailers with Nick Cave‘s “Red Right Hand” playing beneath it, make no mistake, Guillermo del Toro‘s Crimson Peak is a true Gothic romance that just happens to have ghosts in it (as well as copious amounts of blood and blood-like substances).What it is not, is a horror movie. The director himself has not called it that. He’s actually compared it to Hitchcock, particularly Rebecca or George Cukor’s Gaslight (both of which are apt comparisons), but it is as a horror film, that it is being marketed. It was shot February through May and completed in December 2014, but Universal wanted to release it at Halloween, so here we are in October 2015. Make no mistake, there are thrills and chills, and it’s full of murderous intent and malice-aforethought, but no real “scares”, at least in terms of what movie-goers born post-Freddie Kruger and weaned on the Paranormal and Insidious series’ as well as remakes of Halloween, The Fog and Poltergeist, would consider truly scary. Mia Wasikowska is Edyth Cushing, an aspiring novelist, whose biggest champion is her wealthy industrialist father (Jim Beaver). Her aspirations make her something of an outsider to her social climbing contemporaries who prove that the male publishing world isn’t alone in thinking she should be concentrating on getting a husband. So of course, it is is Edyth that the mysterious Thomas Sharpe (Tom Hiddleston), a rakish English demi-noble (his title, “Baronet”, is thrown around a lot) plucks from the bouquet of dewy young things presented to him upon his arrival in turn-of-the-century Buffalo. He quickly marries her, after the shocking (and incredibly brutal) death of her father, who had objected to the match on grounds we are not immediately privy to (made known to him by his hired detective Holly, played by Burn Gorman), then whisks her away to a molding, crumbling estate back in (extremely) rural England, full of ghastly secrets and even ghastlier ghosts. But this film owes as much to Bava as it does Hammer Studios in its hay-day. Charlie Hunnam‘s Dr. McMichael is a “good guy” straight out of their repertory company. The grand score, by Fernando Velasquez, and the dialogue, particularly in the early scenes, is straight out of a period-perfect Penny Dreadful (speaking of which, there are shades of the Showtime series as well – again, not a bad thing at all), with a lot of stilted delivery of the phrase “my child”. Watching Wasikowska and Hiddleston, it’s hard to imagine Emma Stone and Benedict Cumberbatch in their roles. Hiddleston, in particular, was made for this type of film (if you haven’t seen his tortured, soulful vampire in Only Lovers Left Alive, remedy that. Immediately) and the site of him in white tie and tails is indeed impressive and utterly swoon-worthy. Wasikowska gets to be the heroine of her own story, in a departure from the Gothic formula. del Toro has imbued her with the intelligence and resiliance to not only recognize the dastardly shenanigans of her new husband and his creepy sister, but to defend herself against them. The Sharpes are a tragic pair, certainly not your typical villains, created by equal parts nurture and nature, and it is Jessica Chastain’s Lucille that is the beating pulse of this movie. Lucille is fierce and determined, with a stare that is both ice cold and blazing with intensity. She doesn’t go full-tilt bozo until the final reel, but it is a payoff the film has been ratcheting toward from the start and what we’ve been waiting for. (Even then we feel some small measure of sympathy for her.) I don’t want to spoil anything, particularly since most of the plot twists are easily untangled while you watch, but trust me – there are monsters and there are monsters. See Crimson Peak and see it at a theater in all its glory. I’m not usually one to endorse what I consider marketing gimicks, but I highly recommend IMAX for this one. It deserves the biggest screen you can find. Come back and let me know what you think.